Welcome to the Orchard House Bed & Breakfast! 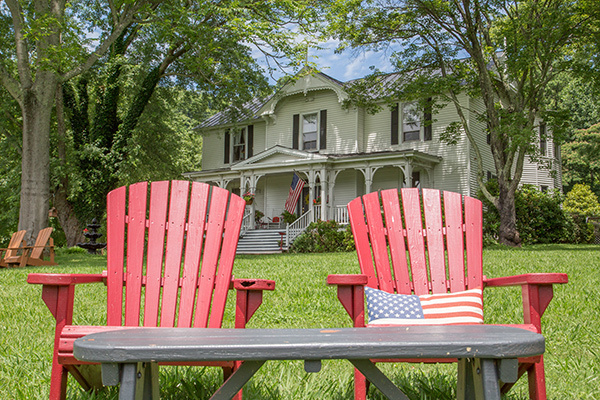 Built in 1874 by a Virginia state judge, it was a successful apple and peach orchard for two family generations. Now the 14 acre property includes two houses, a one-acre vineyard, a newly renovated event/wedding barn, a new gas fire pit, a new in-ground salt water pool, a pond with a fountain, a new gazebo, and multiple spots scattered around for the ultimate R & R. Our main house has six bedrooms, and our Farmhouse has three bedrooms. All rooms have private baths. We are surrounded by Blue Ridge Mountain views, a plethora of wineries, breweries, distilleries, history, antiquing, horse-back riding, amazing restaurants, and an easy 30-minute drive to Charlottesville. We take great pride in our hospitality, generous multi-course homemade breakfasts, and country elegant atmosphere. We would love to help host your corporate event, fitness retreat, quilters weekend, scrapbooking gathering, getaway, bachelorette party weekend, or wonderful wedding. The breathtaking property is well suited for a myriad of events, and we have enjoyed helping to coordinate a wide variety. Regardless of what brings you to the Orchard House Bed & Breakfast, we guarantee that our guests will leave feeling better than when they first arrived! Wedding facility now available in our newly renovated barn, as well as elopement packages, and bachelorette party weekends!